RAM Mounts universal drill type Laptop Stand System installs quickly and easily into most vehicles by using self tapping screws, or by drilling and then bolting down the mount base to the vehicle*. This configuration provides a telescoping feature that ranges from 12 to 18 inches. Dual swing arms provide articulation and 12 inches of reach for passenger and driver access to the mounted device. Patented rubber ball and socket joint provides additional adjustment as well as shock and vibration isolation. *Hardware to secure mount base to vehicle is not provided. 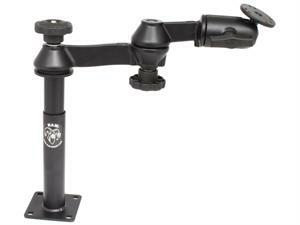 RAM MOUNTS Combination Swing Arm / Tele- Pole with 7" Female Tube Base. Swing Arm length 12". RAM swing arm with swivel feature affords the user unsurpassed comfort when using the keyboard or accessing any mounted device. RAM Mounts adjustable 24" support leg for use with No-Drill systems. Can be installed on floor board or side of transmission hump. RAM MOUNTS Tough Dock Powered Composite Docking Station with Port Replication for the Panasonic Toughbook CF18 and CF19. High Strength Composite Enclosure.